That was Helen, our digital artist and wrangler-in-chief of all things tech. 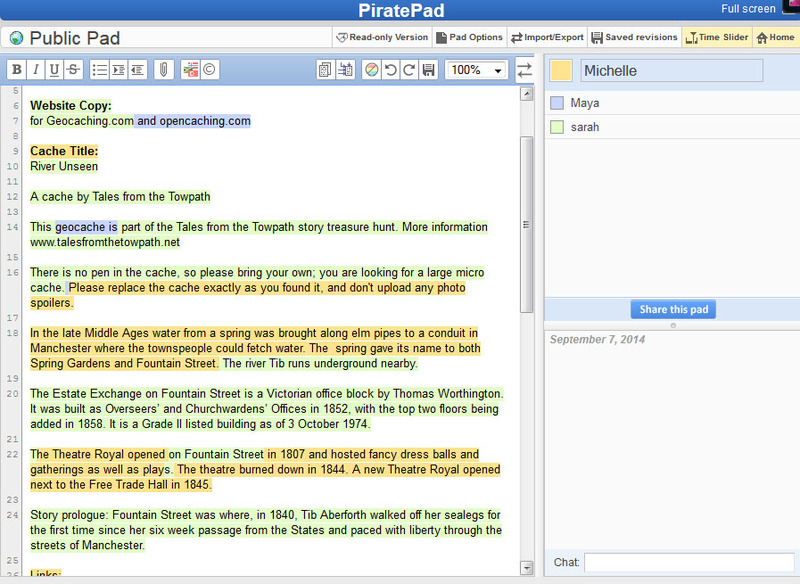 For the uninitiated (like me): PiratePad is a free online collaboration tool for producing text documents. It’s a beta-version basic word processor that allows more than one person to work on one document simultaneously. Most of the online reviews talk about business and administrative applications. Helen, however, had used it as part of a live performance not too long ago, so she could see the creative potential. Back to the first question: who’d used it? Maya had, once, at a transmedia workshop at MadLab, as part of last year’s Abandon Normal Devices festival. Sarah and I were entirely new to it. We were in the midst of our development lab in June, and we’d hit the point in our collaboration where we needed to start knitting ideas together. In past collaborations I’ve been part of, this has been the point where pieces of paper are thrown all over the floor* and we try to agree on who will work on what. Much discussion, many notes, and then everyone takes a piece of text away to work on it alone. Next, a flurry of Word documents are emailed back and forth with increasingly long suffixes: v4, v4FINAL, v4FINALFINAL. Emails go missing. I never really know which is the most recent version. The process feels slow, and confusing. A draft text for the teaser cache (one of six that we’re planting across central Manchester as part of the story trail). Everyone invited to the Pad gets assigned a unique text colour, and pretty soon you’re collectively skidding rainbows across the screen. You know those energised conversations you have with people who really get what you’re on about? The ones where your brain sparks with shared excitement and ideas? It felt like that, but we were capturing it. An accelerated thought process, four brains on one document in real time. An hour went by, and then another. Tangles of logic were smoothed out, and the story grew in four colours. Punctuation was changed, a new piece of dialogue added. I’d have an idea I wasn’t sure of, say it out loud to the room, and by the time I’d finished talking, the words were appearing on my screen, except better, more precise than my first stumbled thought. We talked throughout the whole thing. We have also used more traditional methods of collaborative writing, but have increasingly been using PiratePad for both drafting and editing. I highly recommend it to anyone looking for a creative collaborative writing tool. It’s a little glitchy as it is beta, so don’t forget to save and copy your work regularly, but it’s one of those things that’s so simple and so good, I can’t believe no one built it until now. It can be used by people in the same room together, or across a continent with a voice-only Skype call. One PiratePad session open on everyone’s computer, and three creative hours fly by. I love it. I’m converted. I’m a Pirate. *We still threw pieces of paper all over the floor. Had to be done.